If you ride with others, you must do it in a way that doesn’t endanger anyone or interfere with the flow of traffic. A large group tends to interfere with traffic. It makes it necessary for cars to pass a long line of motorcycles at a time. Also, large groups tend to be separated easily by traffic or red lights. Those who are left behind often ride unsafely trying to catch up. If your group is larger than four or five riders, divide it into two or more smaller groups. Plan Ahead—If you are the leader, look ahead for changes. Give signals early so “the word gets back” in plenty of time. Start lane changes early enough to allow everyone to complete the change. Put Beginners up Front—Place inexperienced riders behind the leader, where they can be watched by more experienced riders. “Follow Those Behind”—Let the tailender set the pace. Use your mirrors to keep an eye on the person behind. If he or she falls behind, slow down a little. If everyone does this, the group will stay with the tailender. Know the Route—Make sure everybody knows the route. Then, if someone is separated for a moment, he or she won’t have to hurry to avoid getting lost or taking a wrong turn. It’s important to keep close ranks and a safe distance. A close group takes up less space on the highway, is easier to see, and is less likely to be separated. However, it must be done properly. Don’t Pair Up—Never operate directly alongside another motorcycle rider. If one of you has to avoid a car or something on the road, there would be no place to go. If you have to say something to another rider, wait until you are both stopped—then it’s okay to pull up alongside. Staggered Formation—Riding in a “staggered” formation is the best way to keep ranks close and yet maintain an adequate space cushion. 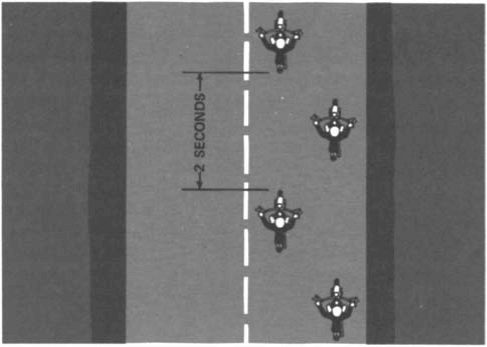 In a staggered formation, the leader rides to the left side of the lane, while the second rider stays a little behind and rides to the right side of the lane. A third rider would take the left position, a normal four-second distance behind the first rider. The fourth rider would be a normal four-second distance behind the second rider. This formation keeps the group close and keeps each rider a safe distance from others ahead, behind and to the sides. A staggered formation can be used safely on an open highway. However, it is best to move into a single file formation when taking curves, making turns, or entering or leaving a highway. speed until they have opened up room for the next rider. As soon as the first rider has passed safely, the second rider should move up to the left position and watch for a safe chance to pass. After passing, this rider should return to the right position and open up room for the next rider. Some people suggest that the leader should move to the right side after passing a vehicle. This is not a good idea. 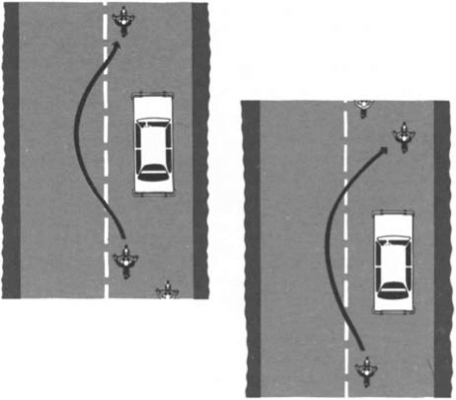 By taking up a rightside lane position, the leader would encourage the second rider to pass and cut back in before a large enough cushion of space has been opened up in front of the passed vehicle. It’s much simpler and safer if each rider waits until there is enough room ahead of the passed vehicle to allow the rider to move into the same position held before the pass.